Fast-moving wildfires in California have claimed the lives of at least eight people and have destroyed more than 1,000 homes and buildings. The fires have been fueled by shifting winds, dry vegetation and record-setting temperatures. To date, they’ve burned through more than 577,000 acres of land, prompting evacuation orders for thousands of people across the state. Emergency crews are battling nine active fires across the state. The Mendocino Complex fire in Northern California is now the largest in state history. It’s burned 283,800 acres and destroyed 75 homes. Officials say the fire, north of San Francisco, is only 30 percent contained. The Carr Fire, which had been the largest before Mendocino began, has now destroyed 1,000 homes around Redding, displacing 38,000 residents. It’s about 47 percent contained, according to the National Interagency Fire Center. In Southern California, crews are battling a growing fire in the Cleveland National Forest. Since Monday, it’s spread to 4,000 acres. This all comes just less than a year after the worst fire season in California’s history, according to CalFire. Late last year, wildfires killed 44 people, burned more than 500,000 acres, destroyed thousands of homes and cost the state $9 billion in insurance claims. Californians are still recovering from those fires, and thousands more will need additional assistance recovering from the blazes that are currently burning across the state — from San Bernardino in the south to Shasta County in the north. The California Community Foundation is accepting donations to help those who are displaced or homeless because of the fires. 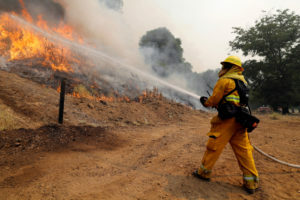 The Los Angeles-based organization will also help rebuild homes and assist with medical needs, like mental and physical health problems and respiratory illnesses exacerbated by the fires. The Haven Humane Society has evacuated and rescued hundreds of pets and other animals from the Carr Fire. The organization is asking the public for donations, including food and supplies, to further help the animals. A full list of supplies can be found on its Facebook page. California Volunteers, a state office that manages volunteer programs in California, has created a list of services and donation options to help victims affected by the Carr, Ferguson, Mendocino Complex and Cranston fires. People can use the list to find information about donations and volunteering. Note: We verified organizations to the best of our ability. If you aren’t sure about the legitimacy of a charitable organization, visit Charity Navigator.